Pet First Aid Awareness Month is a great time to run down your checklist of what to do in case of emergencies. If you don’t have a checklist, now is a good time to put one together! Is the emergency clinic number in a place you can find it in a panic? You might want to think about typing up a list covering the basic signs of poisoning, what to do if your dog or cat is choking, bleeding, gets bit or stung, or needs CPR. What is the appropriate response or remedy for these situations? Having a list to refer to will help keep the panic and anxiety at a lower level should an emergency occur. You’ll have a good grounding for your next appointment with the vet after exploring the useful information at HealthyPawsLA. Healthy Paws was founded by Jillian Myers, a PetSaver certified pet first aid instructor, to help pet owners respond to life-threatening situations with life-saving techniques. Listen to the interview by Dr Lorie Huston. This entry was posted in Mary Haight, Pet Health and tagged pet care, pet first aid on April 2, 2012 by Mary Haight. Pet First Aid and CPR: Would You Know How to Save Your Dog or Cat in an Emergency? Would you know how to perform CPR or provide basic first aid for your pet in case of an accident or emergency? An emergency can happen in the blink of an eye. Tragedy can strike without warning. Being prepared for these types of events can make the difference between living and dying for your pet. That’s why every responsible pet owner should know the basics of pet first aid and CPR. Knowing how to perform basic pet first aid and CPR can certainly help save your pet in the event of an emergency. However, it goes further than that also. Knowing how to perform a health assessment of your dog or cat from nose to tail can help alert you to the presence of issues that may not be an actual emergency but still require medical attention for your pet. 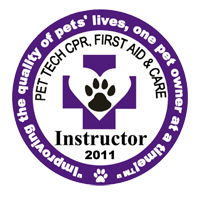 Jillian Myers is a PetSaver certified instructor. At Healthy Paws LA, she teaches pet first aid and CPR courses that are open to any pet owner or pet professional. Jillian joined Animal Cafe’s resident veterinarian, Lorie Huston, for this week’s interview. The podcast is available below. Jillian shared with us, in her interview, the tragic story of how she took her dog, Diego, to her veterinarian for what was supposed to be a routine “teeth cleaning”. Unfortunately, there were unexpected complications after Diego was sent home from the hospital and Diego ended up dying in Jillian’s arms as she rushed him back to the veterinary office. At that time, Jillian knew nothing of pet first aid or how to properly perform CPR on a dog. That day changed Jillian’s life forever as she vowed to do her utmost to make sure that this scenario was not repeated for other pet owners. 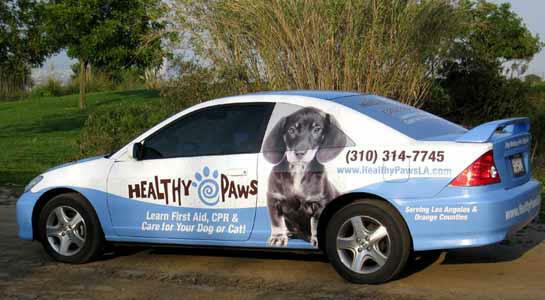 The courses offered at Jillian’s Healthy Paws facility not only include hands-on exposure to basic pet first aid techniques but also teach participants how to care for their senior dogs and cats as well as focusing on proper oral care for pets. But Jillian talks much more about what her classes are like and what is covered in them in the interview, so have a listen. Don’t forget to join the Animal Cafe team next week for another great podcast interview. This entry was posted in Lorie Huston, Pet Health and tagged cats, dogs, pet cpr, pet first aid, pet first aid certification, pets on July 25, 2011 by Lorie Huston, DVM.